Memorials and monuments commemorating the Civil War on the First Coast go far beyond Jacksonville. St. Augustine, Palatka, Olustee, Fernandina Beach, and other communities all have memorials of their own. These include graves, historic sites preserving battlefields and significant structures, place names dedicated to Civil War figures, and of course, Confederate monuments. This article by Bill Delaney highlights how each one represents the way towns have chosen to remember the Civil War in the generations that followed. The region’s Civil War memorials and sites reflect its unusual wartime history. Though Florida was a Confederate state, Union forces and sympathizers controlled parts of the First Coast for much of the conflict. These areas became meccas for escaped slaves striving for freedom. Fernandina, St. Augustine and their coastal forts were in Union hands from 1862 until the war’s end in 1865. Jacksonville saw four Union occupations, the last, permanent one coming in February 1864. Florida’s most significant battle occurred when Union troops from Jacksonville engaged Confederates at Olustee. The earliest memorials, erected in the first few decades after the war, tended to be simple in scope and message, and were generally dedicated to soldiers from the area. Confederate monuments became more common in subsequent years. These increasingly glorified the Confederacy and obscured the region’s Unionist history, as well as the experience of African Americans. At the same time, since the mid-20th century there has been greater public interest in preserving and marking significant historical sites, including Civil War sites. These have attempted to purvey a more balanced and accurate interpretation of the war, with varying degrees of success. With the national debate over removing Confederate monuments taking root locally, it is worth taking a comprehensive look at these memorials and what they tell us about the eras in which they were established. 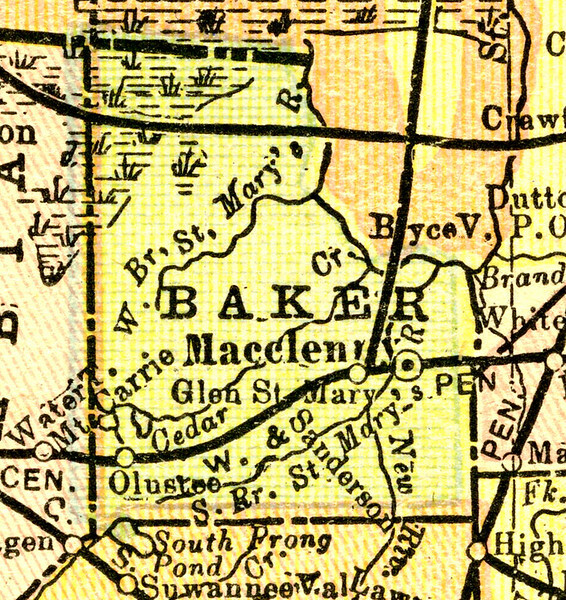 One of the few Confederate placenames that dates to the Civil War itself, Baker County was named after James McNair Baker, a local judge who was subsequently elected Senator in the Confederate Congress. The county was carved out of the former New River County. The decision to create it actually came in 1860, before secession. Graves: 1862- Graves are the earliest commemorations to those who served in the Civil War. These date as far back as 1862, the year of the first engagements. Battle sites, most notably the Olustee Battlefield, contain the graves of hundreds of Union and Confederate servicemen who fell there. After the war, veterans were buried in local cemeteries, including St. Augustine’s National Cemetery, the Tolomato Cemetery, and others. 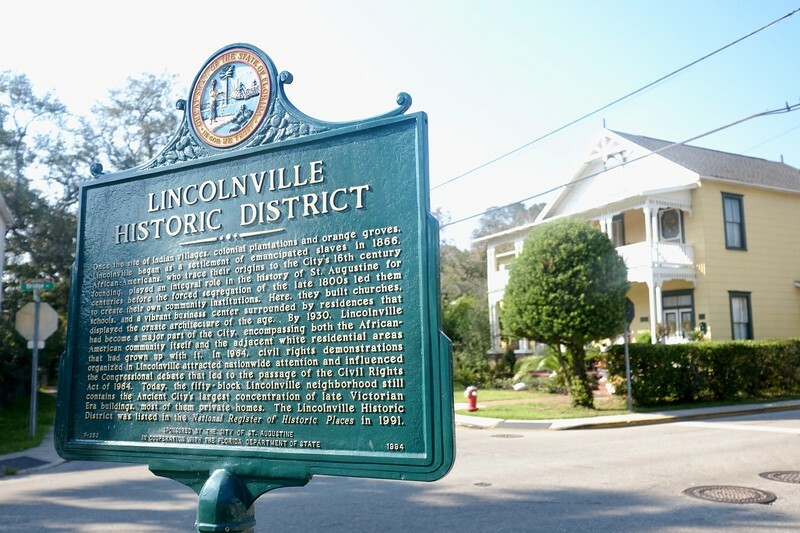 This historic neighborhood, founded by freedmen and women after the Civil War, is named in honor of the Great Emancipator, Abraham Lincoln. Originally called Little Africa, it took its present name by 1878, when streets were platted out and it became more integrated into the city’s urban fabric. It remained the city’s premier African-American neighborhood throughout the period of segregation, and was a hotbed of the local civil rights movement in the 1950s and 60s. In recent decades it has become one of St. Augustine’s most desirable neighborhoods, leading to redevelopment plans and the associated pressures. It was declared a historic district in 1991. 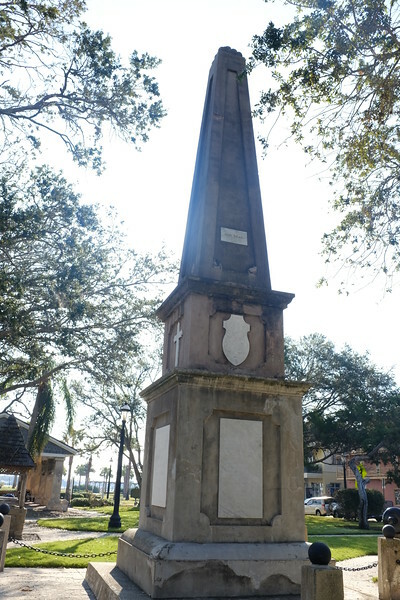 The First Coast’s oldest monument stands in the heart of its oldest city, at the Plaza de la Constitucion in Downtown St. Augustine. Like other monuments of its generation, it is dedicated to Confederate soldiers from the area who died in the war. Its inscriptions list the dead and memorialize them, and do not exalt the Confederacy or its cause. In 1872, during Reconstruction, the Ladies Memorial Association built the original St. Augustine Confederate monument, which had the same marble features present today. It had a wider base and a broken column, symbolizing young lives cut short. It was erected on the Catholic bishop’s property, as the Reconstruction authorities would not allow a Confederate monument on public grounds. In 1879, after Reconstruction ended, the city government allowed the Ladies Memorial Association to move the monument to a prominent place in the Plaza. It was rebuilt in significantly larger form with a new base and column, and the marble pieces moved over from the earlier structure. Nearby are canons from Castillo San Marcos that the U.S. War Department gave to the city in 1900. Town of Hilliard: 1881, Nassau County The town of Hilliard in Nassau County takes its name from Confederate Army veteran Cuyler Walter Hilliard. Town of Macclenny: 1890, Baker County Originally known as Darbyville, Macclenny was renamed for Carr Bowers McClenny, a Confederate veteran from Virginia who had moved to the area after the Civil War. He purchased most of the property of the area’s previous main landholders, the Darby family, after marrying Ada Darby around 1875. By 1890, the town was known by a variant of his name, Macclenny. Yulee: 1891, Nassau County The community of Yulee is named for David Levy Yulee, a Florida railroad magnate, sugar plantation owner, and politician. David Yulee is notable as one of the first two U.S. Senators from Florida, as well as the first Senator of Jewish heritage. Known as the “Florida Fire Eater” for his incendiary defenses of slavery, he supported the Confederacy in the Civil War. The community of Yulee, originally named Hart’s Road, grew around a railway stop established by Yulee’s Florida Railroad in 1856. By 1891, it had become known by its current name.